Today kids learn about the Ice Ages in elementary school, but two hundred years ago the idea of the Ice Ages, while it was just emerging, had yet to catch on. LIke many good ideas, this one had several fathers, among them French, Germans, and at least one Norwegian. But the line of thinking that had the most impact on history decidedly runs with the Swiss, largely owing to the efforts of Louis Agassiz, who once he accepted the idea, ran with it. The Swiss narrative begins in the Valais region of Switzerland, high in the Val d’Bagne, with a bright and insightful mountain peasant named Jean-Pierre Perraudin. Perraudin hunted chamois and served as a kind of proto-mountain guide to curious lowlanders wanting to see his parts of the Alps. One person to whom he gave a tour in 1815 was a geologist, Jean de Charpentier, the director of a salt works in Bex, near the east end of Lac Leman. Likely near the end of their time together, perhaps over a farewell dinner in Perraudin’s chalet in the village of Lourtier, Perraudin opined that many of the boulders in the lower part of his valley had been moved by glaciers from the mountains above at an ancient time when the glaciers were much larger. De Charpentier laughed at the peasant’s foolish idea. 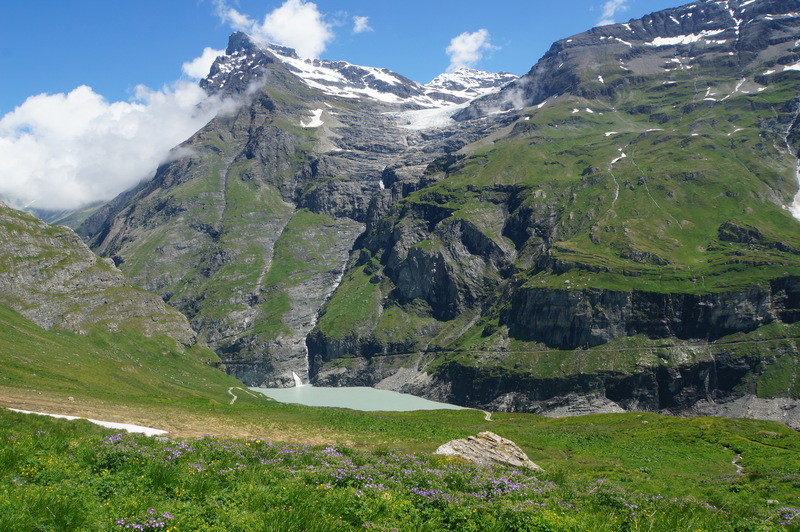 In 1818 ice avalanches from the advancing Gietro Glacier blocked the river high in the Val d’Bagnes, creating a large lake that loomed dangerously over the fields and villages below. Ignaz Venetz, the cantonal engineer, tried, unsuccessfully, to drain the lake (which ultimately flooded the valley), but in the process he too met Perraudin, and although initially skeptical, Venetz did his own investigations, and eventually wrote a paper arguing that the glaciers had formerly been much larger. Initially no one believed him either. But in time, Venetz convinced Charpentier, who too did his own field work and became an advocate, and the two of them convinced the young, ambitious, and aggressive Agassiz, who expanded and championed the idea of the Ice Ages. 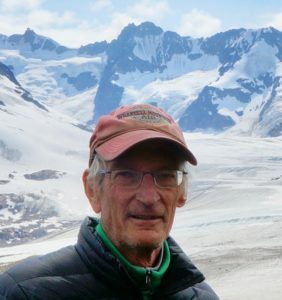 Although Agassiz lost some credibility for pushing the idea too far, he also initiated and carried out studies of existing glaciers and their deposits that provided ultimately convincing support for the basic concept. 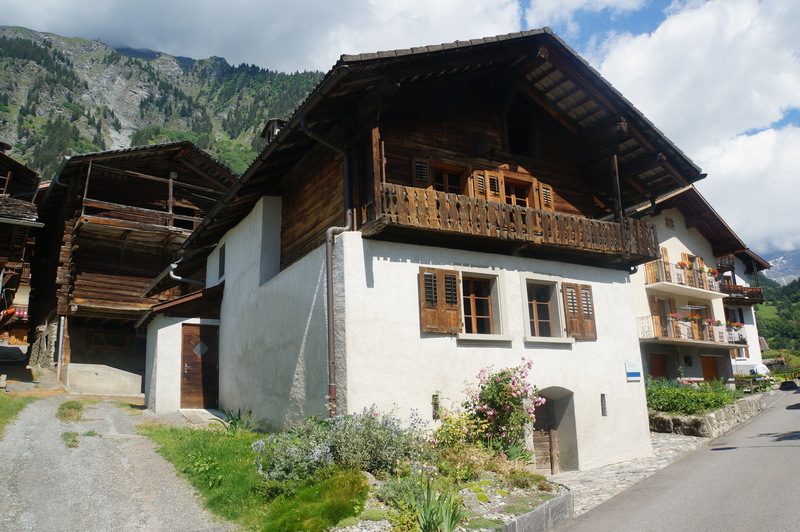 Perraudin’s chalet in Lourtier is now a small museum, La Maison des Glaciers, and Charpentier’s home in Bex, where he hosted and convinced Agassiz, is now an elegant bed and breakfast, La Maison de Directeur. 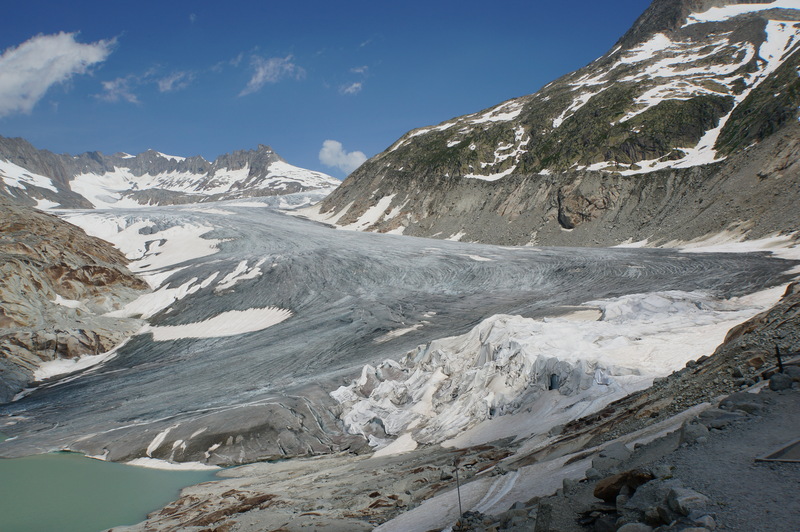 Photo above: The Rhone Glacier in 2018. De Charpentier correctly argued that at the height of the most recent Ice Age this glacier extended down the Rhone River to beyond Geneva, and north beyond Neuchâtel to the Jura Mountains. This interactive map of Switzerland show how much of the country was covered with ice at the height of the last Ice Age (geologist call the time the Last Glacial Maximum or LGM). Today the Rhone Glacier is barely hanging on. The light gray area in the right foreground is a portion of the glacier actually draped with a geotextile to inhibit melting and allow the continued operation of ice tunnels constructed as a tourist attraction. The current front of the Gietro Glacier is just visible in the hanging valley, center, below the skyline. In 1818 avalanching ice from this then advancing glacier blocked the river below, creating a lake that failed in what is now called the Gietro Flood. Today the river has been artificially dammed to generate hydroelectric power. 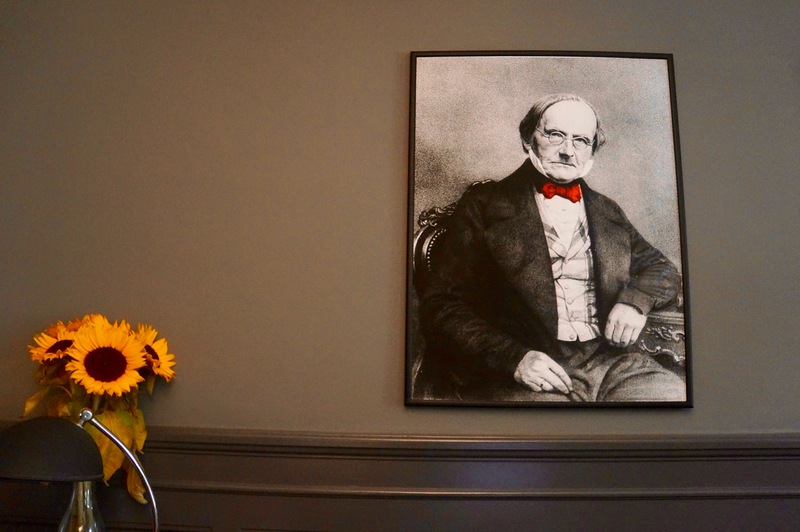 A colored photo of Jean de Charpentier hangs on the wall of his former home, now the bed and breakfast, La Maison du Directeur.